If asked what my favorite color to wear is, I would say, black and white. Which of course is two colors, and really, neither one is a color at all. 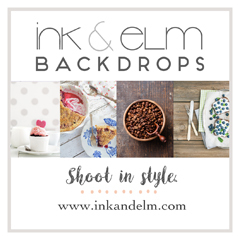 But I just like the combination of black and white, and sometimes I like to add splashes of red, pink or yellow to make it look really pretty and classic. So when a friend asked if I could make a marble cake for her coworker’s birthday, I was excited to decorate the cake in black and white (brown and white, if we’re being technical, but close enough). 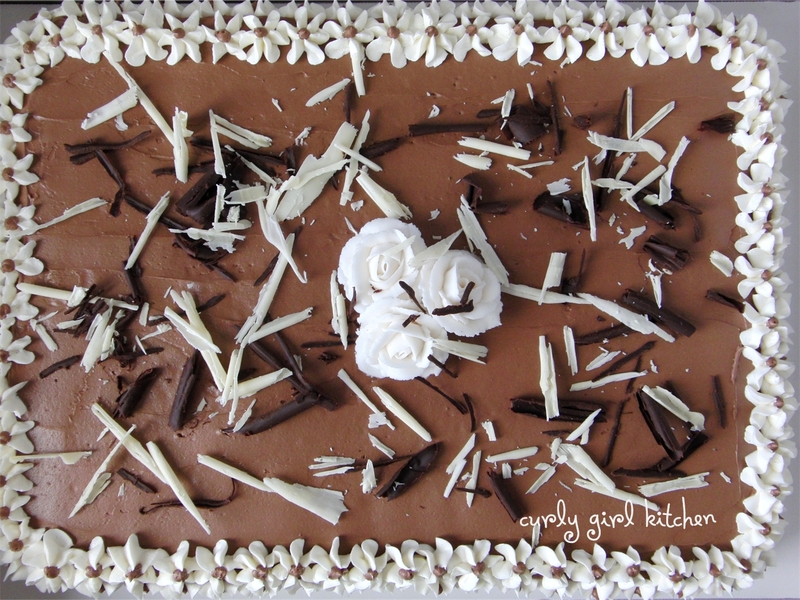 With moist swirls of chocolate and vanilla cake inside, I made a salted chocolate buttercream to cover the cake, then a creamy vanilla buttercream to pipe drop flowers with chocolate centers all around the sides and edge of the cake, and vanilla roses in the middle. 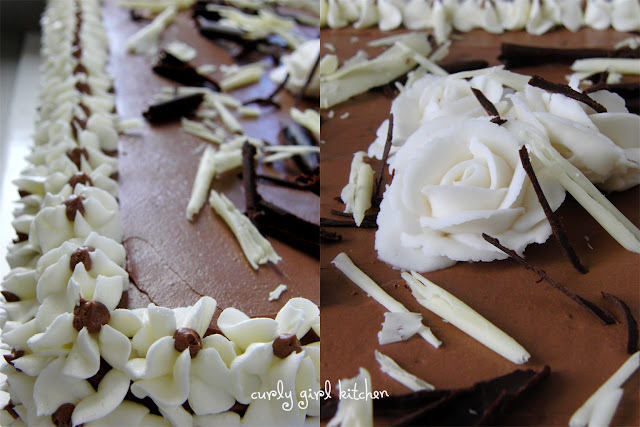 The final touch was a sprinkling of pretty white and dark chocolate curls all over the cake. I didn’t get to taste this one since she picked it up to take to work – although Jamie kept trying to sneak a taste – but one of her coworkers described it as “sinfully delicious.” Just what I was hoping for! Preheat oven to 350; spray an 11x15x2 inch sheet cake pan with non-stick spray, then line with parchment paper and spray the paper with non-stick spray as well. Note: Instead of a sheet cake, you can also use four 8 or 9-inch round pans for a tall layer cake, or cut the recipe in half and use just two round pans. In the bowl of your stand mixer fitted with the paddle attachment, combine the cake mix, flour, milk, oil, vanilla and eggs on low speed to combine, then on medium speed for 3 minutes, scraping the bowl once. Spoon 2/3 of the batter into the pan. Stir the melted chocolate and cocoa powder into the remaining 1/3 of batter. Dollop the chocolate batter over vanilla batter and swirl with a knife then smooth out the top. Bake the sheet cake for 32-36 minutes, or the round pans for 22-25 minutes, until a toothpick in the center comes out clean. Cool in the pan on a wire rack for 30 minutes, then turn out onto the rack, cover loosely with a clean kitchen towel and cool completely before frosting. Salted Chocolate: In the bowl of a stand mixer fitted with the whisk attachment, mix the butters on low speed to combine. In a separate bowl, combine the cocoa powder, powdered sugar and meringue powder. Add to the mixing bowl with the mixer on low. Add the vanilla and milk, then increase speed to medium high and whip for 4-5 minutes until very light and fluffy. Vanilla: In the bowl of a stand mixer fitted with the whisk attachment, mix the butter on low speed. In a separate bowl, combine the powdered sugar and meringue powder. Add to the mixing bowl with the mixer on low. Add the vanilla and milk, then increase speed to medium high and whip for 4-5 minutes until very light and fluffy. Frost the cake all over with a thin crumb coat of the chocolate buttercream. Spread a thicker, smooth layer over the top (the sides do not need to have much chocolate frosting, since you will be piping vanilla flowers all over the sides). After frosting the cake with chocolate, you should have at least half a cup left for the dots in the center of the flowers. Fill a piping bag fitted with a large drop flower tip (Wilton #2D) with the vanilla buttercream. Pipe drop flowers all around the sides of the cake and around the top edge, refilling the bag as needed. 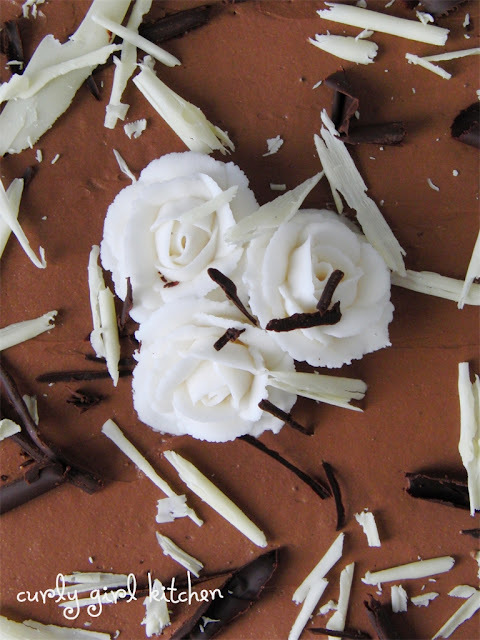 Change the tip to a rose tip (Wilton #104) and pipe three roses to place in the center of the cake. 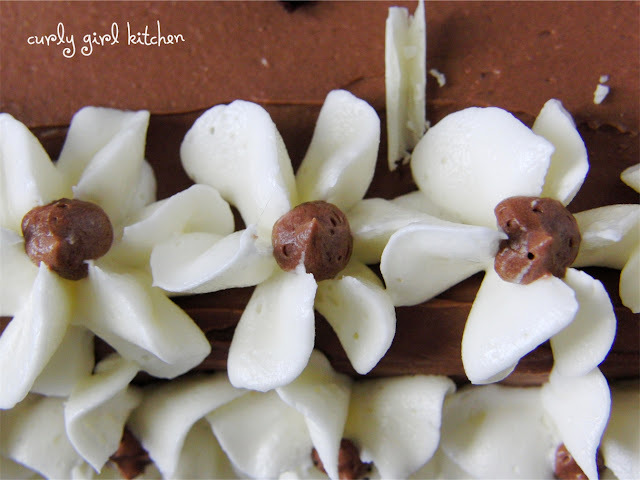 Fill a piping bag fitted with a small round tip (Wilton #4) with chocolate buttercream and pipe chocolate dots in the center of each flower. 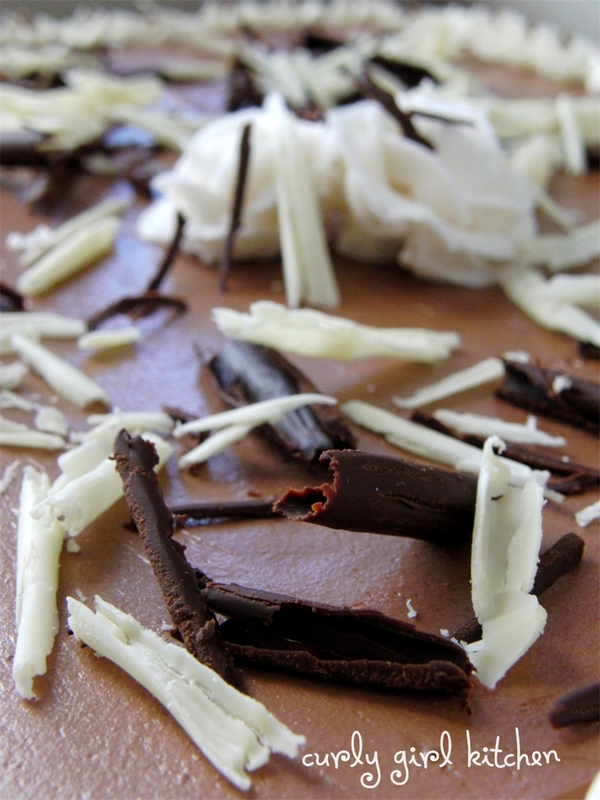 Finish the cake by sprinkling it with white and dark chocolate curls or shavings.